The vast Tsavo ecosystem features a huge diversity of habitats including mountains, rivers, forests, plains, lakes and wooded grassland. Once thickly wooded, Tsavo was transformed over the years into open bush and grassland by the great elephant herds which roamed endlessly across its red earth. These days, though the elephant numbers have been drastically reduced by a series of catastrophic droughts, they still leave a trail of destruction in their wake whilst even more damage is being done to the terrain by the off-road driving habits of the tour operators. Another hazard that park wardens must contend with is fire, especially during the long hot dry summers. Finally, due to the massive size and impenetrability of much of the park, tracking and monitoring the massive animal herds becomes virtually impossible and in the past this has resulted in disastrous poaching. In the 1960's, for instance, Tsavo had the biggest population of black rhinos in Africa (between 6000 and 9000) but by 1981 they had been poached to barely 100 individuals. Today, most of the rhino have been moved to a sanctuary so that their numbers may gradually re-build and poaching is not tolerated, either by the Kenya Wildlife Service or the Kenyan government. 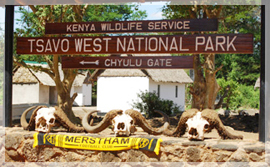 Tsavo is the traditional home of the Bantu-speaking Akamba people who are numerically Kenya's fourth-largest group. Thought to have migrated to Tsavo from the Mount Kilimanjaro region several centuries ago, the Akamba became great traders in ivory, beer, honey, ornaments and iron weapons and, thanks to their knowledge of the interior of the continent, were able to cover a vast region that stretched from the coast to Lake Victoria. Highly regarded for their fighting ability during colonial times, large numbers of Akamba were drafted into the British army where many thousands of them lost their lives during the First World War. 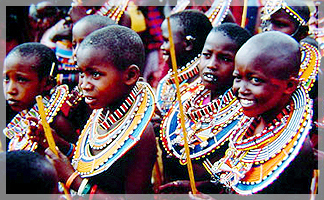 Culturally similar to the Maasai, Akamba adolescents must go through colourful initiation rites before being admitted to adulthood whilst Akamba society is built up around strictly defined age-sets and groupings of elders. Finally the Akamba are famous for the beauty of their wildlife carvings. The Bantu-speaking Taita are essentially a coastal people who have long farmed the southern lands of the region. An intensely spiritual people who, before Christianity, relied on communication with the dead for arbitration and future direction, the Taita farm only after permission has been granted from the tribal elders and sacrifices and supplications have been made to the collections of ancestral skulls that reside in the Taita's sacred caves. Traditional Taita crops include millet, beans, cassava, sugar cane and maize whilst trade revolves around the barter of meat and skins. Traditional crafts include leatherwork, metal work, basket weaving and woodwork. The region is also home to the fabled Maasai peoples. Often strikingly tall and slender, swathed in brilliant red cloth 'Shukas', hung about with beads and metal jewellery, the young men (Moran) favour long, plaited, ochre-daubed hairstyles and have a formidable reputation for glamour, prowess and ferocity. Traditionally the Maasai live off the milk and blood of their beloved cattle and believe that all the world's cattle are theirs by God-given right. Their nomadic and pastoral lifestyle, though historically based on the pursuit of the migratory wildlife, is slowly changing.